St. Michael's Church was in 1200 "a chapel of Bonington which was served by a resident chaplain from the mother church" of Kegworth (Nichol's- "Leicester)." Godfrey quoting the valor of Pope Nicholas in 1290, after stating that Kegworth was taxed at fifty marks, adds "Nec plus valet his diebus quia capella de Bonyngton nuper pertinens ad eandem nunc matrix ecclesia effecta est in dioces Ebor et ibi taxatur," as "Ecclesia de Bonynton." According to Thoroton and the "De Banco Roll 95, Trinity, 20 Edward I., 1292, m. 177 Not" the advowson was claimed by William Patric as the independent parish church of Bonington in which place he paid a Knight's fee, while Nicholas de Segrave claimed as patron of the Church of Kegworth, of which Bonington was a Chapel. The decision of the Court of King's Bench is not given but was evidently in favour of Nicholas de Segrave, for though William Patric presented in 1267 and the Archbishop presented three times while the case was sub judice Sir John de Segrave presented in 1303. The de Segrave's were small Leicestershire freeholders prior to Henry III., Stephen de Segrave, a lawyer, rose under Peter de Roches, Bishop of Winchester, to be Constable of the Tower, 1203, and Regent in 1230. His grandson Nicholas was created Baron de Segrave in 1295. John, 4th Baron de Segrave, married Margaret, daughter of Thomas Mowbray, Earl of Norfolk, by whom he left a daughter Elizabeth, Baroness de Segrave, who married John, 4th Baron Mowbray, in 1353. Earl of Hereford, in 1392. Having arranged to fight a duel at Coventry, Richard II. stopped it and banished Norfolk for life. He died at Venice, 1400. The advowson was seized by the King. He left a daughter Isabel, who married James, Lord Berkeley. Thomas, 7th Baron Mowbray, 8th Baron de Segrave, son of James Lord Berkeley and Isobel, was de jure Duke of Norfolk, but in 1405 rebelled with Archbishop Scrope and others, against Henry IV. and was executed at York without issue. Henry IV., still holding the advowson, was dying of leprosy, so the next presentations were made by his second wife, Queen Joan of Navarre, widow of John de Montfort, Duke of Bretagne. But John, 8th Baron Mowbray, 9th Baron Segrave, brother of Thomas, served well in the French wars and received back the Dukedom of Norfolk from Henry VI., 1426. Then his son John, 5th Duke of Norfolk, died without issue and the Dukedom lapsed. His only daughter Anna, aged 8, married the boy Richard, Duke of York, younger son of Edward IV., who was murdered in the tower. So the Baronies of Mowbray and de Segrave fell into abeyance between the heirs of Margaret and Isobel, daughters of Thomas 6th Baron Mowbray, 7th Baron de Segrave and first Duke of Norfolk. Now Margaret had married Sir Robert Howard and their son John was created by Richard III. first Duke of Norfolk (Howard) and was killed at Bosworth Field, fighting for Richard III. But his son Thomas Howard, for his victory at Flodden Field was created second Duke of Norfolk (Howard) by Henry VIII. He married Elizabeth Tilney, daughter of Sir Frederick Tilney, and she, as Thoroton says, "recovered the advowson (of St. Michael's) upon a Quare impedit against Sir Henry Collet, knight, William Stokes, clerk, together with Thomas, Archbishop of York." Thence the advowson passed to the descendants of Isabel, daughter of Thomas, first Duke of Norfolk, who had married James, Lord Berkeley, and the Lords Berkeley, of Berkeley, Somerset, were patrons, until in 1700 Charles, 10th Lord Berkeley, gave the advowson of St. Michael's to the Dean and Chapter of Bristol in exchange for the advowson of Berkeley. This brief account of the patrons of St. Michael's is of interest as showing that these rich and influential patrons were able to build such a much more beautiful church than the Prior of Repton. Moreover Elizabeth Tilney was of the family of Colonel Tilney, son-in-law of Sir Ernest Paget. John Maunsell, pbr. : by Stephen Patric. Died. 1267. — — Leodegarius de Nottingham by William Patric. 1 April, 1268. Reginal Huse, clerk, by Archbishop of York. 12 Dec. 1269. James de Segrave, cler : by Archbishop of York. 1276. — — R — de Maleys, cler. by Archbishop of York. 21 Sept. 1303. Richard de Assheton, sub-deacon, by Sir John de Segrave. 15 Dec. 1313. Richard de Aston : pbr., by the same. 30 Aug. 1326. Alan de Rothwell, pbr., by Christiana de Segrave, widow. 3 Mar. 1352. Robert de Segrave : pbr., by Sir John de Segrave. — — — John de Leek: pbr. Resigned. 22 June 1358. Robert de Segrave : cap. by Sir John de Mowbray. 24 Dec. 1400. Simon Gaunstede : cler. by King Henry IV. as guardian of Thomas Mowbray, Duke of Norfolk. Simon Gaunstede was Prebend of Crack- pole S. Mary, Lincoln, 1395; Prebend of Bole, York, 1403 ; Archdeacon of Nottingham, 1418. From 19 Richard II. and throughout Henry IV. he was a clerk in Chancery. Master of the Rolls, 1415. Keeper of the great seal, 1416 and 1422. He died about 1423. 27 June 1404. Robert Oxton, pbr., by Thomas Mowbray, Earl of Nottingham, who was executed in the rebellion of archbishop Scrope. So Henry IV. seized the advowson. 6 July, 1408. Thomas Briggs, cler, by Queen Joan of Navarre, second wife of Henry IV., who died of leprosy. — — William Burnaby, by the same. Resigned. 26 May 1409. Hugh Martell, cap, by the same. Resigned. 11 Oct. 1421. John Chartre, cler, by the same. — — Robert Stafford, cler, by the same. Resigned. 11 Nov. 1444. Henry Bradfield, cap, by John Mowbray, Duke of Norfolk. Resigned. 4 Mar. 1445. Henry Sharpe, by the same. Resigned. 27 Oct. 1457. Stephen Sharpe, cler, by the same. Resigned. 30 June 1472. Geoffrey Fairclough, cap, by the same. 3 Mar. 1476. Thomas Ingleby, by Edward IV., the Dukedom having lapsed. Resigned. 1 May, 1480. John Wynmark, cler, by the same. Died. 20 Oct 1498. William Ordenner, pbr., by Elizabeth, Duchess of Norfolk, who recovered the advowson on a Quare impedit. Resigned. 7 July 1536. William Stanley, pbr. by Assigns of Thomas, Lord Berkeley. Rector of St. Anne's. Died. 1538. Dissolution of the Monasteries. 20 Mar. 1541. John Wayte : S.T.P. by Anna, Lady Berkeley, widow of 6th Baron Berkeley. He was deprived, probably as a Protestant by Queen Mary. 3 Dec. 1554. Thomas Thompson, cler, by University College Oxford, probably because the Berkeleys were Protestants : presented again by Philip and Mary : presented again 5 June 1576, by Queen Elizabeth, probably having accepted the Prayer Book. 22 Feb 1579. Edward Barwell, cler, by Master and Fellows of Christs College, Cambridge, perhaps because the Berkeleys had not conformed. 7 Feb 1580. John Savage, M.A., by Lord Berkeley, who was succeeded by his grandson a minor. By his will, dated Jan : 1619, he desired to be buried in the Chancel of Sutton Bonington Church near his son Henry. 1 June, 1620. Thomas Savage, cler, by James I. as the patron was a minor. — — — John Sympson : cler. Same patron. But this must be an error of the Torre MSS. as Simpson was Rector of St. Anne's 1601-1622. when Thomas Savage was presented to St. Annes. 14 Mar. 1622. Thomas Savage, M.A., again by James I., because he had been presented to St. Anne's in 1622 on the death of John Sympson. Buried at St. Anne's : 21 May, 1662. 28 Nov. 1662. John Dashfield, cler, by George, 9th Lord Berkeley, also rector of St. Anne's, canon of Bristol, 1660. Resigned. 31 Aug. 1664. John Strickland, cler, by the same, also rector of St. Anne's. Buried at St. Anne's, Jan. 25, 1664-5. 4 Mar. 1664. William More, S.T.P. by the same. Also Rector of St. Anne's. Buried at St. Anne's, Aug. 9, 1667. 25 Aug. 1667. Nicholas Folkingham, cler, by the same. Died. Last in the Torre MSS. 12 Feb. 1701. Charles Livesay, by Dean and Chapter of Bristol. Canon of Bristol, 1692. Died. 16 July 1739. Henry Hascard. Died. 7 Aug. 1750. Edward Whitley. Rector of Merriott. 1768 Resigned. 31 Jan. 1769. Thomas Taylor. The same. — — Thomas Clare, D.D. — — 1809. Robert Foster. Preb: of Wedmore at Wells, 1820. He died 26 Jan. 1836, aged 54. 17 Feb. 1837. Edward Copleston Philpotts, B.A. Resigned. 13 Mar. 1843. Robert Meek, M.A. Buried at St. Michael's. 6 July, 1866. Ralph Owen Yearsley, M.A. Resigned. 1913. — — George Augustus Seymour Metford, St. Mary Hall: Ox. B.A. 1884, M.A. 1887 : d. 1885, p. 1886, Curate of Holy Trinity Frome Selwood, 1885-90. Ilfracombe 1890-2. Minor Canon of Bristol 1892-1901. Sacrist 1897-1901, Vicar of Holt and Chalfield Magna 1901-13. Died Jan 9, 1922. Buried at St. Michael's. 1922. — — Francis Werner Soames, Ch : Coll: Cam. B.A. 1899. M.A. 1906, d. 1900, p. 1903, Curate of S. John, Fairfield, 1900-2. All S.S Southport, 1902-4. St. Peter, Clifton Wood, 1904-5, St. Andrew, Clifton, 1905-12, Vicar of Drayton, 1912-22. As to the non residence of these Rectors, I can not be so definite as with regard to St. Anne's, but Livesay, Hascard, Meek and Yearsley resided ; Whitley only for a short time. St. Michael's church, Sutton Bonington (A Nicholson, 2006). 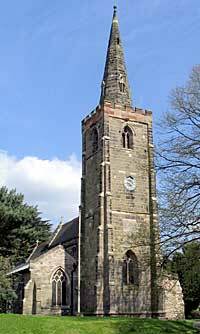 St. Michael's was originally a chapel of Kegworth, but by 1260 had become a Mother Church. No part of this Church is as old as the north aisle of St. Anne's and as the Chancel and Porch were entirely rebuilt in 1876-8 I will only give notes on the nave and aisles. The nave and south aisle are Early-English, 1225- 1250. The masonry of the south aisle consists of thin pieces of Normanton limestone laid in courses with narrow joints, but not so rough or so old as the north aisle of St. Anne's. If this is Early-English, and the piscina at the S.E. corner with pointed arch looks so, the decorated windows south and east must be later insertions. The west window has a square hood. The arcade of four bays of pointed arches with two orders of chamfers has circular pillars with simple moulded caps and bases and corbels at each end. The masonry of the north aisle consisted of tooled blocks of Castle Donington stone laid in courses. The windows and door are decorated and original. The arcade has octagonal pillars, the capital of one and the western respond ornamented with oak leaves. There are stone seats at the bases of the pillars. The whole is decorated, 1325-1350. The clerestory was added in the Perpendicular period and the marks of the original high pitch of the roof can be seen inside at the west end. The Tower of three stages is Perpendicular, 1375-1400, and supports an octagonal spire about 135ft. high. There are five bells. Of these the treble and tenor were added in 1849, for they are inscribed according to Godfrey. Treble. "(Inaccessible) .... Founders, Loughborough. The year of Salvation, 1849. Gloria in excelsis Deo. Amen." No doubt this is "Taylor and Sons, Bellfounders." Tenor. "Israel Hopkins Esquire. The treble and tenor were raised by subscription, A.D. 1849. Taylor and Sons, Bellfounders, Loughborough." The second Bell, as seen by Mr. Stretton in 1810, had "God Save The Church : Our Queene and Realme and send us peace in Christ. Amen. 1599." But Godfrey has it "E . . . . Dolby" : the rest inaccessible," so no doubt it was recast in 1878 when Edwin Dolby was architect for the restoration. Third. "God save our Oueene, 1602." Fourth. "Fostin Fielding Esq. MVXWFI. Henry Stanley, Gen. Thomas Thomson, P.R. Rafe Bunning- ton Gen. Michael Haselrig, Gen., HMVTSY., 1579." Mark of Henry Oldfield. These bells are not the three of the time of Edward VI. and may have been cast by the Oldfields of Nottingham. The letters were probably merely stamped to fill vacant spaces. The Font, 14th century, as a few others at Odiham, Hants., Pitsford, Northants, Rainham, Essex, Raunds, Northants, standing 4ft high on the original steps, has three projecting brackets level with the rim, one on the left for the affusion bowl and the others for the cruets of oil for the chrism. Besides the Staunton tombs mentioned above, Thoroton records others which have disappeared "Upon another tomb in the chancel. 'Orate pro animabus Johannis Berwyks et Margarete uxoris sue et Jacobi filii corum qui de hoc seculo migravit 1538.' He bears Arg : three bears heads erased sable." "In a window there, Or, a lion rampant azure, the Lord Segrave, and gules a lion rampant Or (or rather arg : if it be) Mowbray." "Upon a tomb here 'Here lieth Mygill Stanley, deceased the last day of May 1564 and Mary his wife, that was with child the same day and delivered of a Son named Mygill, the second of October, the same year. This same Mygill Stanley deceased was Son of John Stanley and left his brethren William and Henry to see this work made." He bears Or : three birds legs erased gules." "Upon a chief indented here, Three stags heads Or. impales with a chevron between three towers." "Here lies an Every's daughtr DORMER'S wife, Whose pious work was equal to her life; When here on earth her pilgrimage was done, She left behind, her loving pledge, a sonne; She might have lived longer, had not death Bereaved her of her own to give him breath." Obit Xo die Maij. Anno Domini 1637 et aetatis suae 29." The glass of the east window of the south aisle in memory of Jonathan Barton, gent., who died in 1858, by his widow, is very poor. The south window is fairly good. The east window of the north aisle is by C. E. Kempe : the north east window by Clayton and Bell : the central window is also by Kempe. The chancel windows are by Kempe, except the south-east window, in which the face of St. Mary Magdalen is a portrait of the wife of the Rev. R. O. Yearsley. There is a report on the Church dated 1871, not signed but possibly by Edwin Dolby, the architect who advised in 1876-8, which states that extensive repairs of the worst description had been done about 1855. This report, however, does not agree with the specification of 1878. Anyhow then under E. Dolby the chancel and porch were rebuilt from the foundation and the roofs of Nave and aisles renewed and walls repaired and soil removed. The vandalism deplored above may not have been done then, but in 1855. The oldest register covers 1558 to 1668 and is parchment. The rest are continuous. There is a very interesting Account Book, 1732-1803, containing accounts of the Churchwardens of St. Michael's and of the Overseers and other officers of the whole village. I can find no old Terrier. In 1750 the Tithe produced £123 0s. 0d. and other items, the gross £128 4s. 4d. The Enclosure Award, 1777, allotted to the Rector 134a. lr. 4p. of Glebe in St. Michael's end and 103a. 3r. 24p. in St. Anne's end, total 238a. Or. 28p. Most of this was sold about 1920 and the proceeds, held by the Eccles. Commission, produce £660 per annum with Glebe rent £89 0s. 0d., gross £765 0s. 0d. I know nothing about the Rectory.